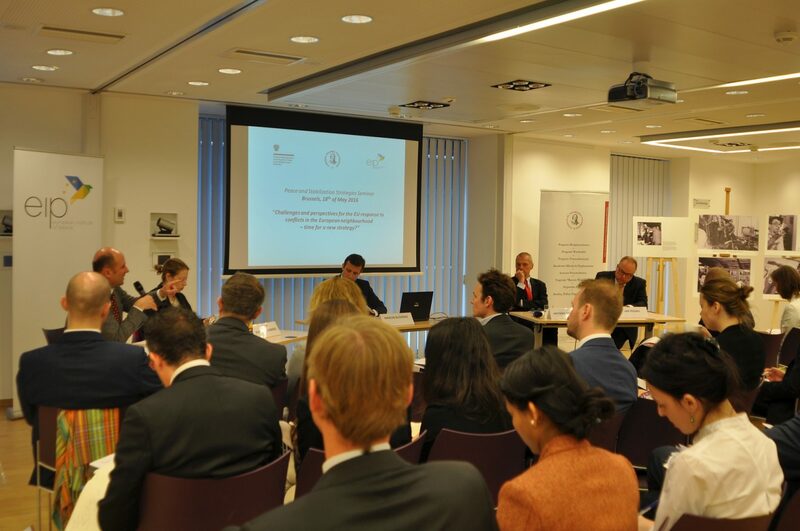 On the 18th of May 2016 the Casimir Pulaski Foundation organized in partnership with the European Institute of Peace a seminar “Challenges and perspectives for EU response to conflicts in the European neighbourhood – time for a new strategy?”. The seminar was hosted by the Polish Permanent Representation to the European Union in Brussels. The seminar was an inauguration of Casimir Pulaski Foundation’s new programme – Peace and Stabilisation Strategies Programme. The aim of the program is to analyze policies towards conflict resolution and stabilization and explore comprehensive strategies combining adequate political, diplomatic, military and economic resources for achieving peace settlements and stabilization. The event was attended by diplomats, experts and practitioners in the areas of security and foreign policy, including representatives of diplomatic corp, international organizations and major European and international think-thanks. The aim of the first panel was to discuss the European Union policies towards conflicts in the broad neighbourhood of EU and changes needed in the current environment of instability. The panel included Antonio Missiroli, Director European Union Institute for Security Studies, Jan Techau, Director of Carnegie Europe, Sonya Reines-Dijvanides, Executive Director of the European Peacebuilding Liaison Office, Roland Freudenstein, Deputy Director of Martens Centre. The discussion was moderated by Marcin Bużański, Director of Peace and Stabilisation Strategies Programme. The second panel was devoted to the practical aspects of implementation of EU policy for support of peace processes and stabilisation in conflict broad neighbourhood. The panel includedn Maciej Popowski, Deputy Director-General for Neighbourhood and Enlargement Negotiations, European Commission, Martin Griffiths, Executive Director of the European Institute of Peace and Fredrik Wesslau, Director of “Wider Europe” at the European Council on Foreign Relations. The panel was moderated by Peter Brorsen, External Relations and Europe Director at the European Institute of Peace. Held under the Chatham House rule, the seminar discussed the difficult situation in Europe’s broad neighborhood, outlining challenges to EU policies for conflict resolution and stabilization, and proposing some practical recommendations for changes to policies of peace processes support, stabilization and crises response. The seminar has been organised in the framework of the Road to Warsaw Security Forum.